Dogfish Head | Beer Apprentice - Craft Beer News, Reviews, Interviews and Info. It’s about time for another craft beer review guys. Thanks for checking back in on the blog. I’m most grateful. Well, for today’s review I’m going to be trying a beer that I’ve heard a ton about, yet have never tried. 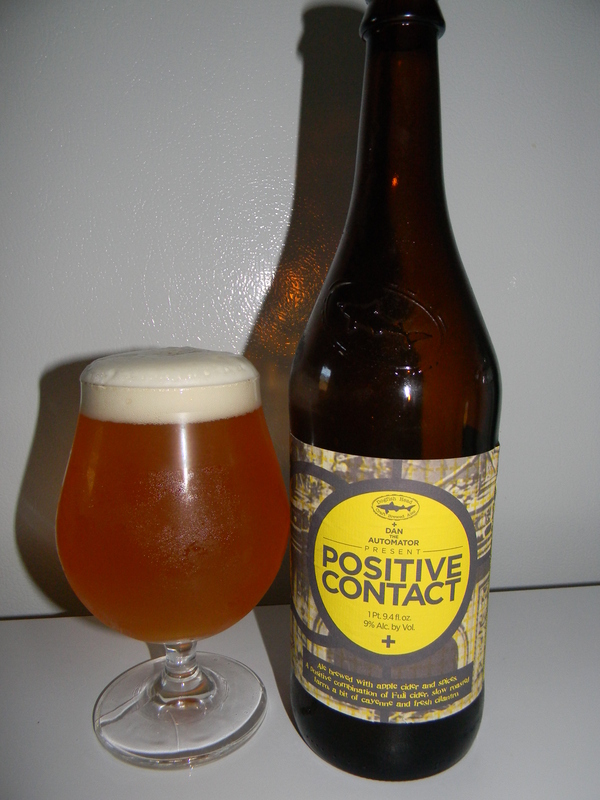 It’s the Positive Contact made by the Dogfish Head Craft Brewery located in Milton, Delaware. We all know about Dogfish Head, so let’s go ahead and click on the website, dogfish.com, and read the commercial description of this brew. A positive combination of Fuji cider, slow-roasted farro, a bit of cayenne and fresh cilantro. This beer part of our Music Series of beers… this one is an amalgamation of hip-hop, beer, cider and a DIY culinary experience! Sam and Dan the Automator of Deltron 3030 teamed up to create Positive Contact, based on Dan’s favorite ingredients and Dogfish Head’s innovative brewing practices. Named after a key track on the first album, Positive Contact is a 9% ABV hybrid of beer and cider brewed with Fuji apples, roasted farro, a handful of cayenne peppers and a late dose of fresh cilantro. This sweet-and-sour Belgian-ish brew is a light straw color with fruity, cider-like notes. The cayenne and alcohol give it a warming finish. How ’bout it? Ready for the pour? This beer came in a 25.4 oz. bottle and it had a 9.0% ABV. It poured slightly hazy with an orangish/golden color. It formed a soft, medium sized, semi-creamy white head. The retention time was very nice and the lacing was more than solid for the duration of the drink. The nose seemed quite complex, yet familiar at the same. It smelled very “Belgiany”. Like a Trippel or a Wit or something. It released tones of coriander and pepper spice as well as a solid dose of yeast. I also recieved a waft of apples skins and maybe a hint of pear. A nice grassy, floral bouquet came about too. Almost like a fresh field of clover. Overall, the fragrance was well balanced, harmonious and nice. The flavor was nearly the same as the aroma I thought. Very Belgian like with those pronounced spices of pepper and coriander while the yeasty components formed the sturdy backbone. The fruity apple and pear added some sweetness, which helped to balance everything out. Tasty. The mouthfeel was medium bodied. It was dry, crisp and semi-refreshing with a slight bite. The carbonation was medium to high and a touch of warmth was felt from the relatively high ABV content. A lot of flavor was left behind after each swallow too. Overall, I thought this was a very nice beer. Easily a brew that I wouldn’t mind having again. I’d definitely recommend it to a friend as well. It has plenty of character and personality, yet it’s easy enough to drink so as to not overwhelm someone just getting into craft beer. I think it would be a nice beverage to have at just about any point in the year too. It could match up really well with the Spring and Summer for sure, but I may even pair it with that Thanksgiving turkey if given the chance. With that being said, if you have the opportunity to grab a bottle of the Dogfish Head Positive Contact don’t hesitate. I think you may enjoy it. I know I did. Hi guys. For today’s craft beer review I’m going to be trying the Dogfish Head Burton Baton produced by the Dogfish Head Craft Brewery located in Milton, Delaware. Let’s get right to the website, dogfish.com, and see what kind of information we can find out about this beer. This oak-aged gentle giant has been gaining popularity over the past few years and is now available year-round. For Burton Baton, we brew two “threads,” or batches, of beer: an English-style old ale and an imperial IPA. After fementating the beers separately in our stainless tanks, they’re transferred and blended together in one of our large oak tanks. Burton Baton sits on the wood for about a month. When enjoying the Burton Baton, you’ll find an awesome blend of the citrus notes from Northwestern hops melding with woody, vanilla notes from the oak. The wood also tends to mellow the 10% ABV of Burton, so tread cautiously! This brew has a 10.0% ABV and it comes in a 12 oz. bottle. It poured a deep orange color with an off white head that was nicely sized. The texture was thick, smooth and kind of creamy. The retention time was long lasting and it left behind some very nice lacing too. A ton of clear alcohol legs were left on the sides of the snifter when I tilted it from side to side as well. The nose was sweet and sugary with a good deal of dank, piny, resiny hops. Citrus of orange and tangerine. Quite malty too with just a little bit of vanilla and oak bringing up the rear and bumping up the complexity. The taste let loose with more wood/oak. Again, just a slight touch of vanilla. More of the resiny and piny hops with further bits of orange and tangerine. The bitterness was solid and manageable. Some sweet caramel malt and bready aspects add a smidgen more complexity. The alcohol comes into play with the taste, but it never really distracts from the other flavors. The mouthfeel was medium to full bodied. Sticky, chewy, dry and smooth. The carbonation was a tad on the lower side. A substantial amount of warmth was felt from the alcohol and an excellent dose of flavor was left behind on the palate for me to enjoy throughout. Well, this is a fairly big, but good beer. It’s solid all around. The drinkability was “ok” considering the size, however I doubt that I could make a night of it. It definitely has plenty of flavor and character to be pondered for the duration and I’m sure that this brew would be suitable for most any craft beer drinker, but it’s not my favorite in the Dogfish catalog. I don’t know…. it just didn’t blow me away like I thought it might. Only my opinion however. 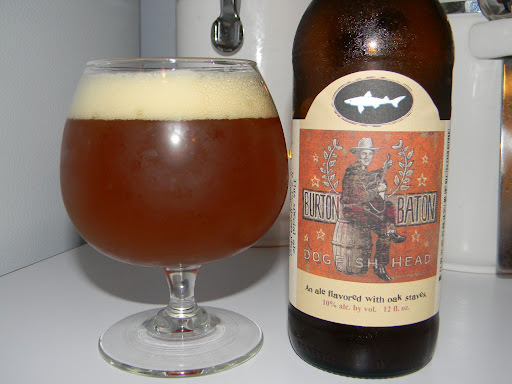 So, the next time you see the Dogfish Head Burton Baton give it a try if you have yet to do so. Feel free to leave your opinion in the comment box if you wish. Thanks for reading everyone. I really appreciate it. Time for another craft beer review. Thanks for checking back in. I hope everyone is enjoying their Labor Day weekend so far. For today’s review I’m going to be trying the Dogfish Head Red & White produced by the Dogfish Head Craft Brewery located in Milton, Delaware. Let’s journey over to the website, dogfish.com, and see what kind of information we can drum up about this beer. Red & White is a big, Belgian-style witbier brewed with coriander and orange peel and fermented with pinot noir juice. After fermentation, a fraction of the batch is aged in one of our 10,000-gallon oak tanks. The idea for Red & White was born at a beer and wine dinner Sam attended on the West Coast. Whenever there’s peanut butter and chocolate in the same room, Sam’s gonna mix ’em. Red & White successfully marries the refreshing citrusy qualities of a Belgian-style white beer with the robust complexity of a bold red wine. It’s been one of our most popular limited-edition beers at our Rehoboth Beach, Del., brewpub and at festivals around the country. Reach for Red & White when you’re grilling meat or nibbling on buttery cheese. This brew comes in a 25.6 oz. bottle and it has an ABV of 10.0%. It poured a relatively clear, orangish to amber color. The head was barely off white, soft, soapy and rocky. It was sized perfectly. The retention time was outstanding and the lacing was more than adequate. When held to the light it almost appeared to have a slight rust color. Very attractive sitting in the glass I must say. The nose smelled fruity. Hints of soft orange and tangerine citrus. Light tones of wood and coriander spice too. Definitely got a whiff or two of some grain and wheat. Overall though, it wasn’t quite as robust or forthcoming as I thought it might be. It was still balanced and harmonized very well however. The taste was rather fruity and sweet as well. Savors of sugar, orange citrus and tangerine. The coriander spice and woodiness were almost non-existent in the bottle I tried. I don’t know, it may have just been me. It did present a strong bready aspect with a good dose of bitterness to complete the flavor profile I must say. Still a very pleasant taste with this one. The mouthfeel was medium bodied. Dry, soft, smooth and crisp. Kind of refreshing to be honest. The carbonation was good, lively and easy. It left a decent amount of flavor behind too. No warmth was found from the alcohol, which surprised me considering the 10.0% ABV. I thought this was a very nice and very good beer. It had a killer drinkability. I was finished with the bottle before I even knew what had happened. I tried the Black & Blue a little while ago and struggled with it a bit, but I had no trouble with this one. I really enjoyed it and I would surely never turn it down if I saw it or if it were to be offered to me. 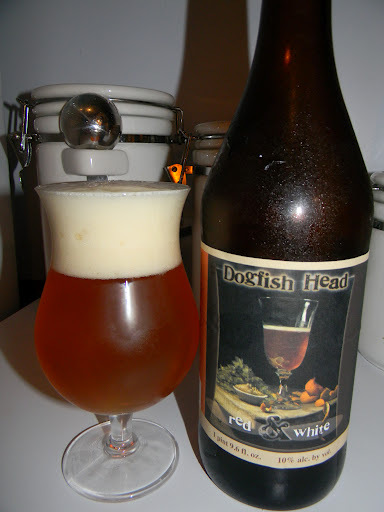 So, if you guys haven’t had the Dogfish Head Red & White yet, pick it up and give it a try and see what you think. I believe that you may like it.